Since the inception of National Theatre Wales in 2010, TEAM has been an integral part of what it does. Designed to be a different kind of national theatre that had a relationship with the communities it serves, TEAM is a national network of now over 2000 people who help to influence the direction of NTW, work on its shows and receive free training and capacity building. There is a TEAM panel that makes decisions on programming, recruitment, governance and policy, as well as being represented at board level by a rolling set of panel members who become trustees. 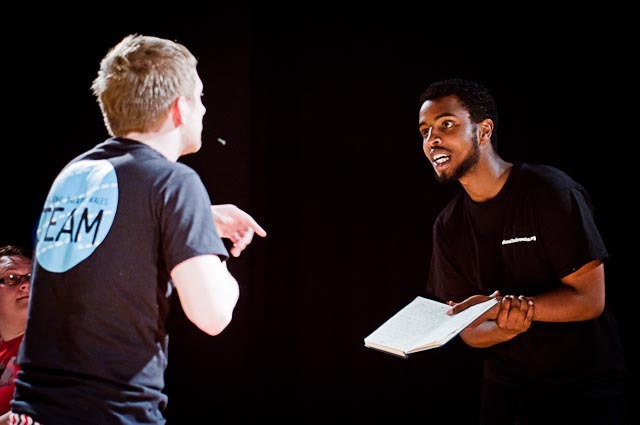 TEAM invests in its members by providing training in everything from playwriting and acting to production and governance. They have helped introduce Ali to organisations he has now collaborated with including Battersea Arts Centre, Contact Manchester, Welsh National Opera, Wales Millennium Centre and others. Whilst some opportunities are volunteering based, many lead to paid opportunities. Devinda talks about it as redressing a power balance – ‘How much power are you willing to give over? Will you listen to opinions and change the way you do something?’ Engagement is not a separate thing at NTW, it’s integrated into everything they do. The commitment to governance led by TEAM members and their community means their work stays relevant and the artistic quality remains high. The next step is for TEAM members to put on two shows in the main season of NTW, managing every aspect from start to finish. TEAM members will decide on everything from concept to delivery, with all performers and directors coming from, or decided upon, by the group. This way of working may feel difficult for some, but NTW have seen huge benefits without compromising their integrity.